There are indeed “reactionary elements” at the Vatican. But the bigger problem might be here with the Catholic Church in America, specifically those not-so-small quarters of extreme theological, cultural, and political conservatism within bishops’ chanceries, in seminaries, and at Catholic colleges. It can be tempting to draw a parallel with the nationalist Catholic group Action Française, which Pius XI condemned in 1926. But there is no single group in the U.S. that has become as significant. Still, the “radical traditionalist Catholicism” embodied by Bannon and Burke is representative of something larger than the fringe out of which the schismatic Society of St. Pius X grew in the 1970s, itself an offspring of reactionary, anti-Vatican II French-speaking Catholicism with deep roots in the neo-fascist French political right. No pope is above criticism, including obviously Francis. But the American Catholic neo-conservative and “rad trad” critique is truly exceptional. Nowhere in the world is the opposition to Francis so militant and extremist. There may be no strategic coordination between Burke and Bannon, but the attempts (including John Allen’s) to normalize what is happening as “the usual clash of competing ideologies and worldviews” do not sound very convincing. So far, the radical-traditionalist successes have been more political than theological. What they couldn’t dream of in 2013 or during the Bishops’ Synod of 2014-2015 was to have the White House of Donald Trump on their side. Now, not all the opponents of Francis would align with Trump. But there is no question that a well-organized group see with the Trump presidency an opportunity to fight back against a pope who clearly has challenged the theological-industrial-military complex they view as essential in defending the Judeo-Christian West against global Islam, or anything challenging the supremacy of America. This is an apocalyptic extremism that should give pause to the more moderate, neo-conservative, establishment Catholic opposition to Francis. Still, news of the apparent alignment of the administration with the extreme elements of the opposition to this papacy could actually strengthen Francis’s leadership in the Church. The revelation of contact between Bannon and Burke (and Burke and Italian xenophobe and Northern League leader Matteo Salvini, who likes to say, “My pope is still Benedict XVI”) has, I believe, revealed the dangerous extremism of its most vocal representative, well beyond his well-known passion for colorful gloves, the cappa magna, and all the rest. 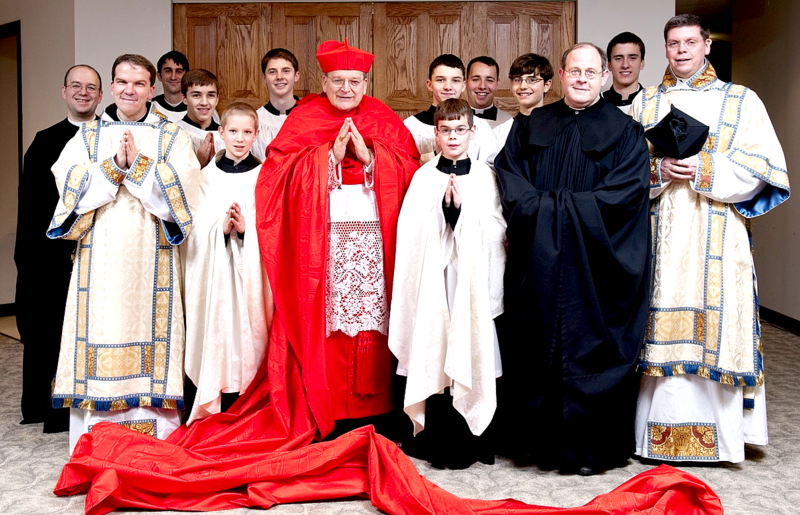 If Burke goes for the Lefebvre option (formal schism now), it would be under the banner of “Trumpian” Catholicism—Islamophobia and bigotry—and not for the defense of traditional teaching on marriage, or the prerogatives of the Sovereign Military Order of Malta. Until the Synod of 2014-2015, Cardinal Burke could still claim to represent a respectable, “traditional” Catholic opposition to Francis. Not anymore. The project of Bannon and his fellow Catholic ideologues is not traditional at all; it’s not even traditionalist. Monsignor Lefebvre was shocked by Vatican II, which he saw as the Catholic equivalent of the French Revolution, and tried to restore a 19th-century counter-revolutionary, anti-modernist Catholic culture. But there is no “Catholic past” in the imaginings of Bannon and the Dignitatis Humanae Institute, only American supremacy—which was never part of Catholic traditionalism. But the influence of Burke remains a powerful factor in American Catholicism. For one thing, many of the U.S. bishops appointed under John Paul II and Benedict XVI came out of the Bishops’ Congregation that for years he had close involvement with (Francis removed him from the Congregation in December 2013). For another, his ideological position on the meaning of Vatican II has many adherents. It springs directly from the position announced by Richard John Neuhaus in 1987’s The Catholic Moment: “The contest over the interpretations of Vatican II constitutes a critical battlefront in our society’s continuing cultural wars.” (Neuhaus came back to this several times, including in a 2003 First Things article). Thus the Burke-and-Bannon Catholicism is also a byproduct of the culture war, itself based in part on the rejection of Vatican II. These fundamentally different understandings of Catholicism in contemporary America were in place before Francis. But his pontificate has made the rift more visible, while the election of Trump has lent it a new political cast, one formed by the theological eccentricity of anti-conciliar American Catholicism. Whether this intra-ecclesial rift heals, grows, or develops into something else remains to be seen.